No matter where you are located in the world, all babies begin life producing similar sounds. Prior to learning words, the noises that come from your little one are referred to as ‘baby babble’. You may hear your infant babbling from a young age, many months before they even learn their first word. 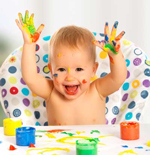 In this article we will have a look at some basic English words that babies tend to pick up in the first 2 years of life. 1 When Will my Baby Begin to Talk? 2 How Can Parents Encourage their Baby to Talk? When Will my Baby Begin to Talk? While your baby begins to talk and communicate through crying and facial expressions not long after birth, their first directional word will come around the age of one (although each baby differs). Each baby is unique and they all learn at an individual pace. While many babies have a collection of words by one, others can only pronounce a handful. As your infant grows into a toddler their vocabulary broadens. The following table demonstrates the average age that a baby will reach different speech milestones. If your child is not reaching these milestones and you believe that they are falling behind make an appointment with a doctor. Often hearing loss and tongue ties directly affect a child’s speech milestones. Around one year old your baby will begin to say ‘real’ words. How Can Parents Encourage their Baby to Talk? Praising your infant when they baby babbling will encourage even greater expression. Smiling or clapping when your baby ‘coos’ or ‘gurgles’ will give them the encouragement they need to broaden their speech. Imitating your infant will let them know that you are listening to what they are saying. They may giggle at your repeating their words. Your baby may not be responding to you just yet but they are intently listening to everything you say. Narrating what you are doing throughout the day such as ‘I’m making your breakfast for you now‘ can help your baby understand what words relate to what action. 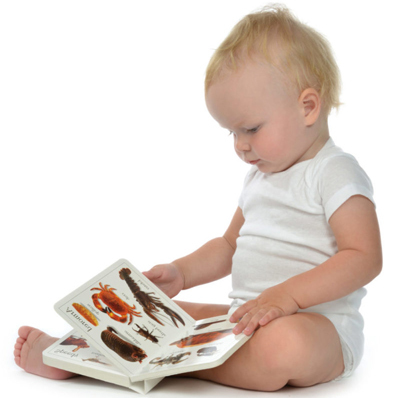 Reading to your child allows them to pick up on many new words within their first years of life and also acts as a bonding experience. You can begin to read to your child from birth. Where possible, parents should attempt to read to their child once a day. Purchasing age appropriate reading books will ensure the words are suitable for your child’s age. There are many ‘First Word Books‘ on the market. These books usually contain 50 to 100 different words with matching images. This allows your child to relate a word to an item or action. Singing songs and rhymes to your baby will help them pick up on new words. Rhymes such as ‘Incy Wincy Spider’ and ‘Baa Baa Black Sheep’ are fun for your child and will help them learn new words. Below you will find a list of 100 different first words and ways you can teach each of them to your child. By three years old, your son or daughter will generally be able to say all 100 of these words. Pointing to yourself and demonstrating to the infant who their mother is. Pointing to other families and demonstrating who the mother is. Pointing at the infants father when voicing the word ‘Daddy’. Teaching your child who the father is within shows on TV. With a waving motion say goodbye to someone leaving the home/area. Wave and say the word ‘Hello’ if you are greeting someone with your infant. After giving your child something to eat ask them if they would like ‘more’. 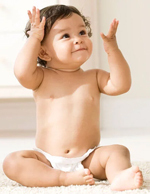 If your baby raises their arms to be lifted, ask them if they would like ‘up’. Point to a bird in the sky and tell your child ‘Look what is up there’. 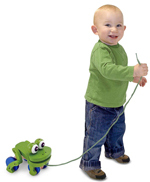 If your child is winging and pulling to the side, ask them if they would like to hop ‘down’. Use this word when you ‘open’ a new present or ‘open’ a cupboard door. Let your child know that you are opening the cupboard to get their cereal out. Use this word when you are ‘closing’ doors or draws. When you put them in their car seat, let them know that you are going to close the door now. Use this word around meal times. 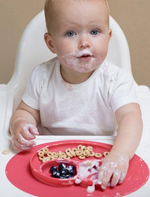 Ask your infant if they would like more to ‘eat’ or ask them if they have finished ‘eating’. If you have an animal, describe what they are eating. It’s great to start introducing your child to names of other relatives and family members early on. Many families shorten grandma and grandpa to make it easier for the infant. When indoors refer to you and your child as ‘being inside’. When you take your infant to the park or for a walk let them know you are going ‘outside’. Ask your child if they would like a ‘drink’ while displaying their drink bottle. 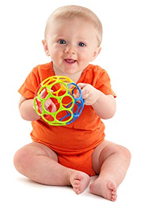 When playing with a ball let your child know the name of the object. Quoting ‘Catch the ball’ or similar will help your child understand what the object is called. Balls appear in many first word books and in turn are among the top baby first words. Ask your child if they would like to read a ‘book’. Your infant will not reply although it allows them to understand the name of the object. Tell your child it’s almost time for bed but we will read a book first. 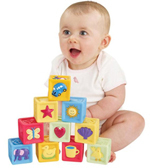 When your child is playing with blocks, let them know the name of the object. Ask your child to stack the blocks up high for you. Teaching manners from the start to your infant will encourage them to use them later on. Children lead by example so make sure you are demonstrating good manners aswell. When you pass your child a toy say the word ‘tah’. Tah is an easy word for your child to pronounce when they begin talking. When putting your infants shoes on tell them what they are and what you are doing. Explain what color your child’s shoes are. Ask your child if they can give their doll a cuddle. Describe what the doll is wearing. Ask your child to sit up at their chair for meal times. Explain that a chair is for sitting at. Tell your child that you will be having breakfast/dinner at the table. Describe how big the table is. Tell your child what color the flowers are. Ask your child to smell the flowers or pick on for a relative. Ask your child if they are thirsty. Tell them that you will give them a drink out of a cup. Explain to your child what goes on a plate. If your child has a play kitchen give them some plastic plates to serve their own gourmet delights on. Ask your child if they would like moms help with feeding from a spoon. Describe what a spoon does and when it is used. When going outside let your child know that they must put their hat on. Describe the color of the hat to your child. Tell your child that they will need to put their arms up to remove their top. Ask them about the color or pattern on their top. Tell them that they need to get new pants on. Let them know how you are putting their pants on. When the sun and moon are out point to them and explain them to your child. Many children take and interest in the sun and moon. Let them know that the moon comes out when it is sleep time. Let them know the sun comes out during play time. Tell your child that they need to lie down in their cot. Explain that the cot is where they go to sleep of a nightime. When you turn off the light let your child know what they are doing. When your child is due for a nappy change, let them know that they will need a new nappy ‘ on’. Many children own a boat bath toy. Describe the boat to your child and mimic the sound a boat makes in the water. Ask your child ‘What are you doing hiding under the blanket?’. When exploring outdoors with your infant point at the trees while saying ‘Look at these beautiful trees’. Tell your child what color the tree is. Ask your child what they would like to do. If your child is looking tired lay them down. When your child wakes up ask them if they slept well. Ask your child if they are hot when playing outdoors. Ask them if the bath water is too hot. During the winter months ask your child if they are cold. If your child enjoys ice-blocks ask them if they would like a cold treat. After a messy meal exclaim ‘You are so dirty now. Time for a bath’. Point to dirty animals if you visit a zoo or farm. After giving your baby a bath tell them that they are all clean now. 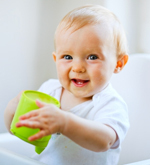 When washing the dishes, let your infant know that you are cleaning up. 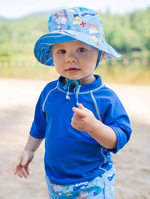 When you take your child in the pool let them know that you and him/her are all wet now. If it is raining outside explain that it’s too wet to go to the park. 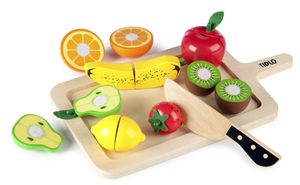 Food related works can be taught to an infant through play. Wooden or plastic fruits and vegetables can be purchased. These allow your child to visually see an item while you explain what it is. 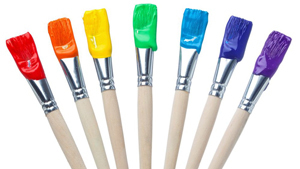 When you and your child do art together tell them what color they are using. Color flash cards are also a great way to teach your child a range of colors. 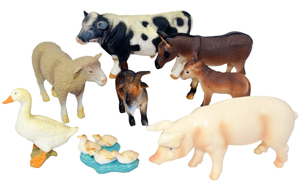 Plastic animals are great toys to introduce your child to new words. As they pick up an animal explain what it is and what sound it makes. Also singing nursery rhymes will help your child with animals and their noises. A great nursery rhyme to sing about animals is ‘Old McDonald’. 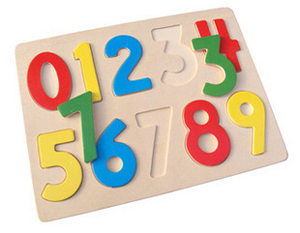 Wooden number puzzles is an easy way to expose your child to numbers. By two years old your child may have picked up on a handful of numbers.